The information that we are interested in isn't always in the language that we want or that we understand, therefore, on many occasions it is very annoying not to understand a text. 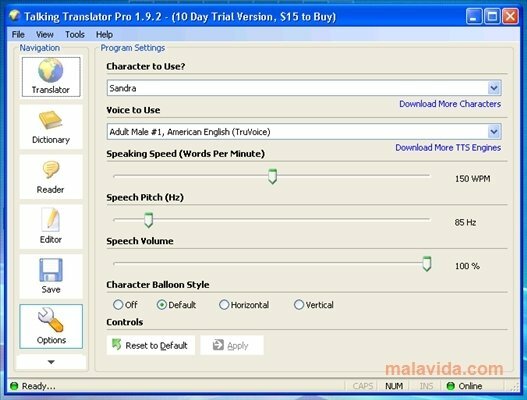 Talking Translator Pro is a very easy-to-use application that will allow us to translate between 8 different languages (English, Spanish, German, French, Italian, Dutch, Russian and Portuguese), find the definition of each word, or listen, thanks to an audio engine, to the sentence that we choose with the native pronunciation of each language. Talking Translator Pro accepts special characters from each language, includes an integrated text editor, allows us to import contents from any source (websites, rich text or clipboard) and allows us to export the translated text to PDF, text, HTML or rich text. Don't waste any more time looking for a tool that will help you to understand any text, because Talking Translator Pro offers you all you need to edit, translate and listen to any document, no matter where it comes from.